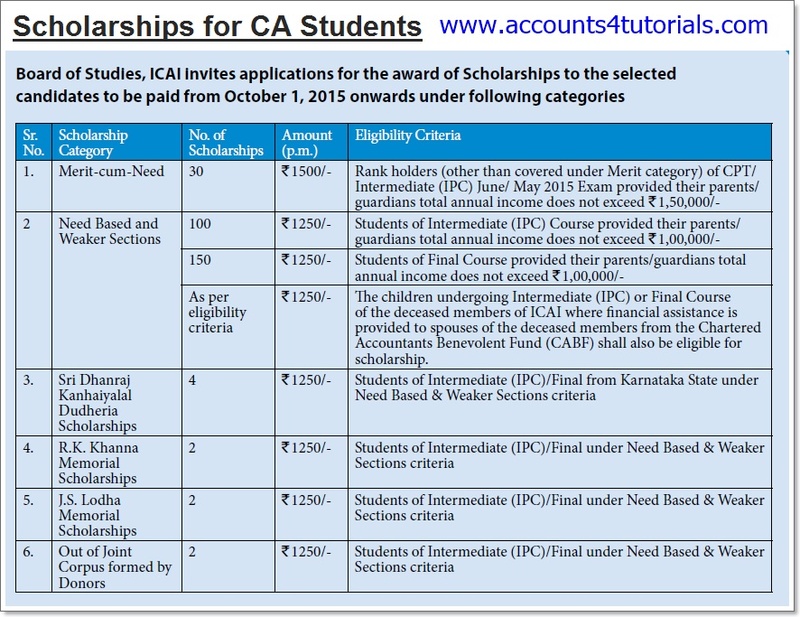 Board of Studies, ICAI invites applications for the award of Scholarships to the selected candidates to be paid from October 1, 2015 onwards under following categories. 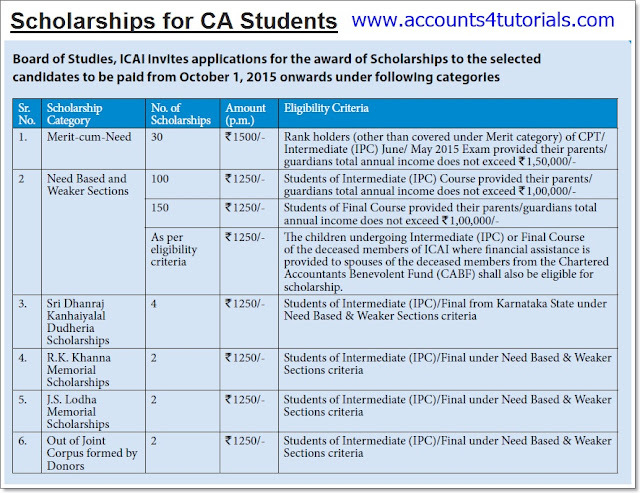 Board of Studies, ICAI also awards Merit Scholarships to the Meritorious Students as a token of appreciation. Students whose names appear at Sl. No. 1-10 of Merit lists of CPT/ Intermediate (IPC) of June/ May 2015 Exam, in case the Rank at Sl. No.10 continues to Sl. No. 11 or 12 or so on, then all such rank holders securing the same marks in a particular rank shall be granted @ Rs.1500/- p.m in case of Intermediate (IPC) and Rs.2000/- p.m in case of Final students. Such students are not required to apply. The detailed guidelines along with the requisite application forms are available on the Institute’s Website (www.icai.org) (link: http://www.icai.org/post.html?post_id=6486 ). Applicants shall be the registered students of Intermediate (IPC) or Final Course. In the case of Intermediate (IPC) Students, Scholarship shall be paid for a maximum period of 18 months. In the case of Final students, Scholarship shall be paid for a maximum period of 30 months or balance period of their articleship, whichever is less. An additional amount of Rs. 100/- p.m. shall be paid to SC/ ST/ OBC students, under Need-based and Weaker Sections Category. They shall have to enclose a certificate/ documentary proof duly attested by a gazetted officer or a member of the Institute. One scholarship under the Need-Based and Weaker Section Category is reserved for a Physically Challenged student. Duly completed and signed Application Forms in the prescribed formats (Form No. 3 & Form No. 4) should reach the Additional Secretary, Board of Studies, The Institute of Chartered Accountants of India, ICAI Bhawan, A-29, Sector-62, NOIDA-201309 latest by 30th September, 2015.